Charges During The Day & Provides Colorful Mood Lighting at Night. The perfect way to improve the look of your backyard and add some useful lighting at the same time. 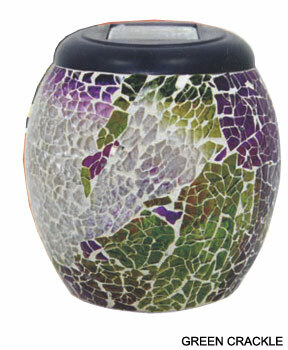 These Mosaic lanterns are perfect for patios, decks, porches, or any other outdoor space. They look great during the day, but become amazing to look at as soon as it gets dark. 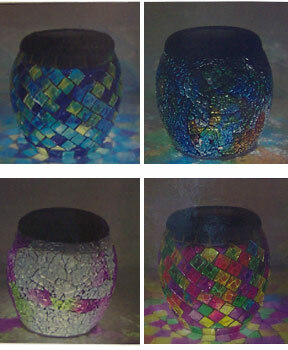 The high quality glass mosaic jar creates a lovely splash of colorful light right where you need it. It is decorative, functional and incredibly versatile. You can place one just about anywhere thanks to the battery and sun powered operation. It doesn't need to be plugged in or wired in any way, so once you find the right place, your set-up is complete. 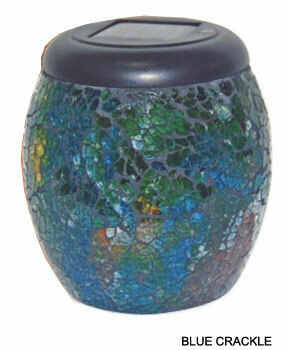 It comes with a rechargeable Ni-MH battery pre-installed to power the super bright LED light in the interior of the jar. During the day the solar panel on top of the unit collects energy from the sun in order to recharge the battery. Once it gets dark, the unit automatically turns on to create a beautiful display of bright, colorful light. The lighting effects that are created due to the fractured glass pieces are truly amazing. Place it on any surface for a pleasing light display. This LED Lantern makes a great centerpiece for your outdoor table or deck railing. Get several lights in order to create a spectacular arrangement that is sure to be the envy of all your friends and family members. Order Yours Today! Dimensions 4" x 4" x 5"
Solar Powered LED Lantern - The perfect way to add colorful accent lighting to your backyard patio or deck. The sun charges the battery during the day, and the lantern automatically turns on when it gets dark. A Heavy Duty Broom For Rugged Use & Commercial Settings. Solar Powered Outdoor Lighting. Single Color, Or Multi-Color Fade. Wall Mounted Storage From Monkey Bar. Lifetime Warranty. High Quality Storage Device. Hang And Organize Up To Three Bags Or Carts.